I tried to find a right balance between possible hiss and complete silence in track intro/outro, in order not to cut important parts of audio. Audio files are scanned once playback was started (including playback queue files). Firstly played track on playlist is not considered for skipping its intro, because silence end position is unknown at that moment. All scanned tracks information (intro/outro position) is saved to a local database file. The maximum audio duration is 15 minutes. This is a first version of plugin so you should expect some issues. Good plugin, +1. I have it working. Thank you for approval of my plugin, also for new short description and thumbnail. All suggestions and issue reports are welcome. 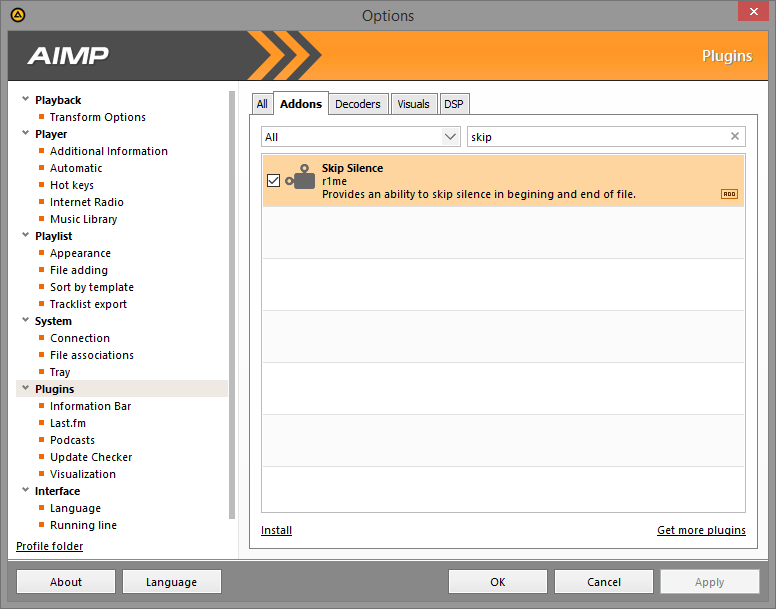 I'm using latest SDK, it is not planned to support older versions of AIMP with my plugins. Other than that, there is an issue with the plugin. It can detect wrong outro position and jump to next track way too quickly (i.e. 1 minute before end). I'm working on this. Other than that, there is an issue with the plugin. It can detect wrong outro position and jump to next track way too quickly (i.e. 1 minute before end). Yes, I ran into this once, but couldn't reproduce it. Есть предложение по расширению возможности плагина: возможно ли добавить вот такие настройки плагина? Also thanks for all suggestions, threshold option will be added sooner or later. could be added more audio format like flac and other format? and at work i use the portable version under w7 , does this plugin keep aimp4 portable or does it write in the registry? Почему-то бывают моменты, когда переход на следующий трек осуществляется автоматически, не смотря на то, что в настройках предпосылок для этого нет. Пока ещё не нашёл в этом закономерность, но это явно есть, и не раз с этим сталкивался. По привычке заглядываю в настройки в раздел "автоматика" дабы проверить, но переход тем не менее осуществляется, не смотря ни на что. I'm pretty new at using AIMP so I might be overlooking something simple but... How do you use this plug-in? I've tried installing the plug-in both manually and through AIMP but it's not doing anything automatically and I don't see any possibility to configure it. I'm using the portable version of AIMP 4.50. Is that maybe the cause of my trouble? Otherwise this seems to be a great plug-in to have! Is the plugin displayed in Options / Plugins / Addons? Please note that the plugin requires AIMP v4.10 or higher. I don't see any possibility to configure it. The plugin is without settings. Thanks for your reply. I re-downloaded the portable package and reinstalled the plug-in. It works now which is great! This means I can't reproduce the problem I had though. Although most probably it was something I did wrong.